The following ideas come from The Resource Room. (They are available on The Resource Room or as an instant download. 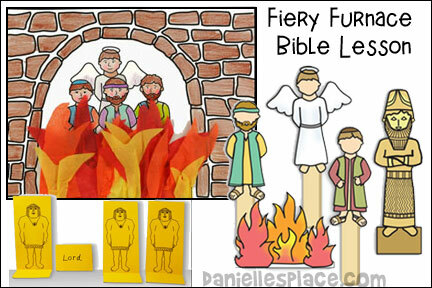 Six printable characters and flames to act out the story of the Fiery Furnace. Children color them, add faces, cut them out and add craft sticks to make stick puppets. 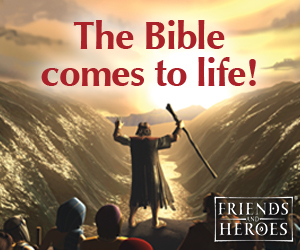 Available in the Shadrach, Meshach, & Abednego Lesson above. Single Instant Digital Download for $2.00 - - Six, 7-inch Characters and Flames in both color and black and white. 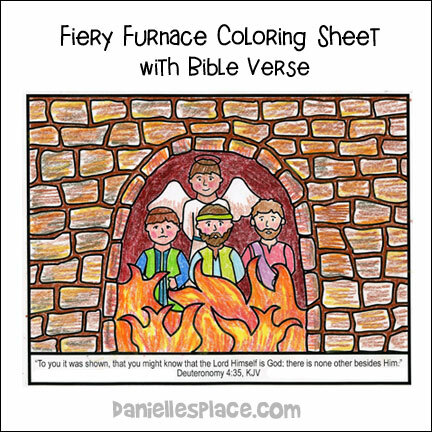 Shadrach, Meshach, and Abednego and an Angel in the Fiery Furnace coloring sheet available to members and as an instant download above. This project is a little more complicated and should be used with children second grade and older. 1. 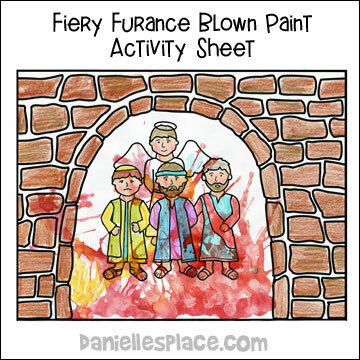 Before class print out the fiery furnace activity sheet. 2. 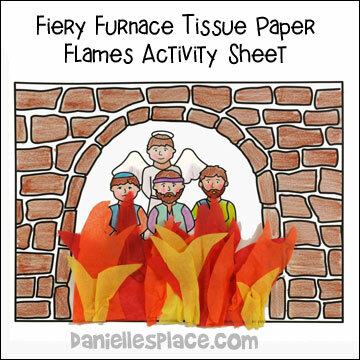 In class have your children color the fiery furnace and men and then tear up pieces of red, orange, and yellow tissue paper and glue them so they cover most of the figures to look like flames. Second grade and older children will enjoy working on this project together. 1. Bring in a box that is at least 12" square, red, and yellow tissue paper or cellophane, glue, tape, and a flashlight. 2. Give your children some ideas, but let them come up with their own ideas and designs also. 3. If you have a lot of children, you may want to break them up into groups of four or five and have each group work on a diorama. 4. Cut a door out of one end of the box. You can have your children draw where they want the door and then cut it out for them with an Exacto knife. Also cut out a hole in the back of the box so that a flashlight will fit through it. 5. Cover a flashlight with some red tissue paper and place it through the hole. This will make the tissue paper in the box glow. You may want to do this before class if you are uncomfortable about bringing a knife to class. 6. Cut flame shapes from tissue paper. Bunch about 3 or 4 flames together and twist them together at the bottom. Bend down the twisted edge and tape it to the bottom of the box. Straighten out the tops of the flames with your fingers. Place some flames in front of the men and some in the back. 7. Glue the four figures cutout (patterns available to members) or the stick puppet figures above to some heavy card stock and cut them out. Leave some extra paper around the bottom. Bend the extra paper back and glue it to the bottom of the box so the figures stand up. Children color the picture of Shadrach, Meshach, Abednego, and the angel and then blow through a straw to make flame shapes from water color paint. To finish they glue the picture of the furnace over the coloring sheet. (Kindergarten and older) Divide the children up into two teams. Pick one child from each team to be a statue. They should be about the same size. Tell your children that the team that moves their statue to the opposite end of the room first wins, but the only way the statues will move is by it's team members answering questions correctly. When a team member answers correctly, the statue can move one leg forward as far as he can without bending his knee. The team that has their statue reach the other end of the room first wins. 1. Before class print out the statue pattern and cut them out. 2. Glue them onto thick cardboard and bend the bottom up towards the front of the statue so that the statues stand up. 3. 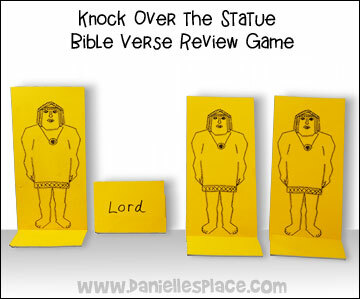 Write one word of the Bible verse on the bottom of each statue. 4. In class have the children take turns throwing a bean bag at the statues to try to knock them backwards so that a word of the Bible verse is revealed. Each time a child knocks over a statue, let him take a turn to try to guess what the Bible verse is. The child who can say the whole Bible verse on his turn first wins. Before a child throws the bean bag ask him a question from the story. If you have very young children, ask them very simple questions such as "Can we make a god like king Nebuchadnezzar?" Remind the children what each word is every time a child takes a turn. Have the child that is going to take a turn throwing repeat the words that are already revealed. Use only the "The Lord is God" part of the verse for younger children. (Any age) Tell your children they are one of King Nebuchadnezzar's statues. Have them all stand up and stand like a statue. Tell them that these statues can move, but only when the music is playing. If the music stops, they must stop moving. Play some music and turn it off every ten or more seconds and then turn around. If a child is still moving when the music stops, have him sit down. Keep playing until only one child is standing. This is an outside game. Have the children line up at one end of the room and pretend to be statues. The king stands at the opposite end of the room. Tell the children that you are King Nebuchadnezzar and they are your statues. The "statues" must try to reach King Nebuchadnezzar without him seeing them move. The statues cannot bend their knees or their elbows. The king turns around and faces away from the "statues". The king can yell, "Freeze" whenever he wants and then turns around to make sure none of the statues are moving. If he spots a statue moving, that "statue" has to go back to the start line. When a statue makes it to the king, it becomes the king. Tape strands of orange, red, and yellow crepe paper to two small room fans. Tip the fans up toward the ceiling and turn them on so that you have a fiery furnace. Have students re-enact the story, taking turns playing the three brothers, the angel and the king. Make sure that someone always plays Nebuchadnezzar and says, “Shadrach, Meshach, and Abednego, servants of the Most High God, come out!” This idea was sent in by a subscriber. (You can make this activity fit your age group.) If you have preschool children just pick three children to be Shadrach, Meshach, and Abednego. You play the king. Tell the children to bow before your God or they will be thrown into the fiery furnace The children then say, "No." Take them to the fiery furnace and then look in and say, "Didn't I throw three men in the furnace? I see four men! Then tell Shadrach, Meshach, and Abednego to come out. Then say, "There is no other god that can do this!" Keep playing until all your children have had a chance to be Shadrach, Meshach, and Abednego. If you don't have fans, you can tape crepe paper streamers to jumbo craft sticks. 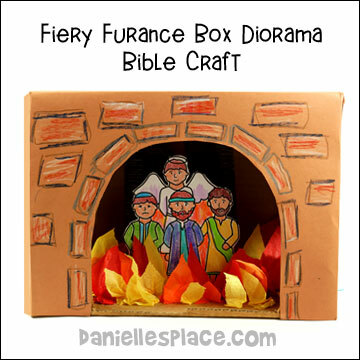 Have the children stand around in a circle to make the fiery furnace and wave their streamers up and down to look like flames. Read the following poem and have your children act it out. This poem can also be used with the Fiery Furnace Experience above. 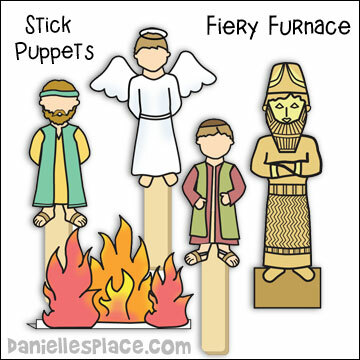 123 Homeschool 4 Me used this stick puppet craft to make Shadrach, Meshach, and Abednego stick puppets. 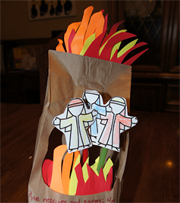 She used an upside-down paper lunch bag to make the fiery furnace. She cut a hole in the bag and taped fire-shaped pieces of paper to the bag. The puppets are inserted through the top of the bag to act out the Bible story. Go to 123 Homeschool 4 Me for complete directions. 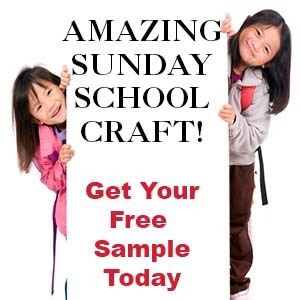 To print out the stick puppets go to the Anytime Crafts Page. The king said, "Wow, now I know".